SOUP OF THE WEEK: I often make a big pot of soup and pack it in my lunch all week when I'm working. Today (Sunday) I'm making my favorite soup-- my own recipe for Amy's Potato Soup. 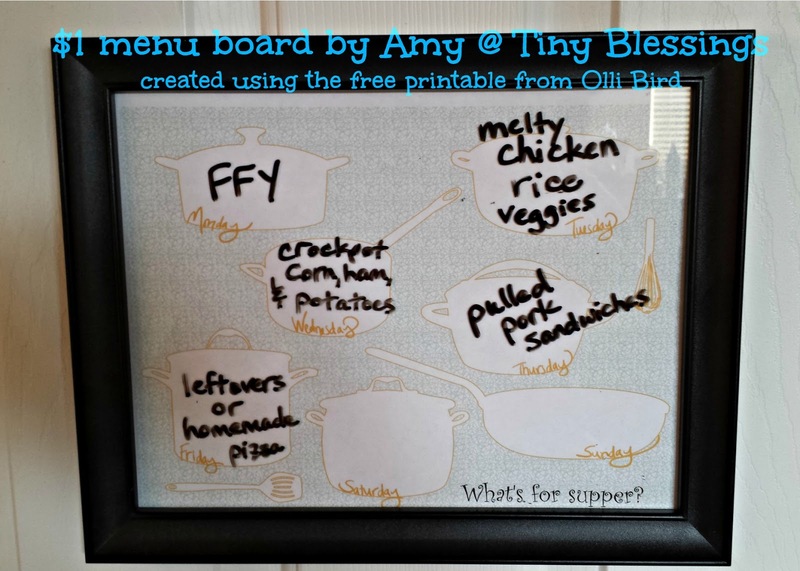 LAST WEEK'S MENU NOTES: We loved the Melty Chicken. I'll be putting that recipe into my regular rotation, especially since the ingredients are some I always have on hand. The menu board is also becoming a source of entertainment, as the kids add their editorial comments and drawings to it during the week. I'm so glad I finally put together that simple project! TUESDAY: new Pinterest recipe: "No Peek" Chicken & Rice, steamed broccoli * I've been wanting to try this forever but it has to bake for 2.5 hours, so I had to save it for a day that I'll be home all afternoon!